Peterborough strengthened their grip on the final League One play-off spot with victory over Gillingham. Britt Assombalonga opened the scoring with his 30th goal of the season, firing past Gills goalkeeper Stuart Nelson at his near post. Skipper Tommy Rowe doubled their lead with a 20-yard drive that crashed in off the underside of the bar. Assombalonga earned a penalty when he was felled by Bradley Dack but saw his tame spot kick saved by Nelson. Peterborough now hold a six-point advantage over MK Dons, who are one place below in seventh. "I thought it was a convincing win. The first goal was very important because people were getting a little frustrated. "We didn't want to do anything different to the gameplan. My only disappointment was it should have been more than two goals. "We know Tommy (Rowe) can get a goal from midfield. That's one of his strengths. It's perhaps an area of the pitch we don't get enough goals from." "It was a very disappointed goal to give away in the first half and you've then got to stick together and fight like mad and I think we did that. "If we'd had more belief in passing the ball, then we might have asked a few more questions of Peterborough. "We've got another couple of wins in us. They're prepared to put the work in so it's going to be tight." Match ends, Peterborough United 2, Gillingham 0. Second Half ends, Peterborough United 2, Gillingham 0. Attempt missed. Danny Swanson (Peterborough United) right footed shot from outside the box is just a bit too high from a direct free kick. Joe Martin (Gillingham) is shown the yellow card. Conor Washington (Peterborough United) wins a free kick in the attacking half. Foul by Joe Martin (Gillingham). Attempt missed. Adebayo Akinfenwa (Gillingham) header from the centre of the box misses to the left. Corner, Gillingham. Conceded by Jack Payne. Substitution, Peterborough United. Craig Alcock replaces Kgosi Ntlhe. Attempt missed. 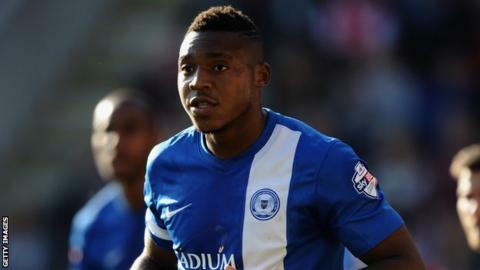 Britt Assombalonga (Peterborough United) header from the left side of the six yard box is just a bit too high. Attempt missed. Danny Swanson (Peterborough United) right footed shot from the centre of the box misses to the right. Corner, Peterborough United. Conceded by Stuart Nelson. Attempt saved. Britt Assombalonga (Peterborough United) right footed shot from the left side of the box is saved in the centre of the goal. Attempt missed. Joe Martin (Gillingham) left footed shot from outside the box is just a bit too high from a direct free kick. Cody McDonald (Gillingham) wins a free kick in the attacking half. Foul by Tommy Rowe (Peterborough United). Steven Gregory (Gillingham) wins a free kick on the right wing. Jack Payne (Peterborough United) wins a free kick in the attacking half. Substitution, Gillingham. Connor Smith replaces Bradley Dack. Penalty saved! Britt Assombalonga (Peterborough United) fails to capitalise on this great opportunity, right footed shot saved in the bottom right corner. Penalty Peterborough United. Britt Assombalonga draws a foul in the penalty area. Penalty conceded by Bradley Dack (Gillingham) after a foul in the penalty area. Nicky Ajose (Peterborough United) wins a free kick in the defensive half. Foul by Myles Weston (Gillingham). Goal! Peterborough United 2, Gillingham 0. Tommy Rowe (Peterborough United) right footed shot from outside the box to the top right corner. Attempt missed. Conor Washington (Peterborough United) right footed shot from the left side of the box misses to the left. Foul by Bradley Dack (Gillingham). Attempt missed. Danny Swanson (Peterborough United) right footed shot from the left side of the box misses to the right. Corner, Peterborough United. Conceded by Charlie Lee. Corner, Peterborough United. Conceded by Joe Martin. Attempt saved. Danny Swanson (Peterborough United) right footed shot from the centre of the box is saved in the bottom right corner. Corner, Gillingham. Conceded by Tommy Rowe. Corner, Gillingham. Conceded by Jack Baldwin. Attempt blocked. Elliott Hewitt (Gillingham) right footed shot from outside the box is blocked. Corner, Gillingham. Conceded by Robert Olejnik. Attempt saved. Cody McDonald (Gillingham) right footed shot from outside the box is saved in the top centre of the goal.